As all in one solutions go, you simply cant beat the A100 Amplified Bass Tubes by Bazooka. 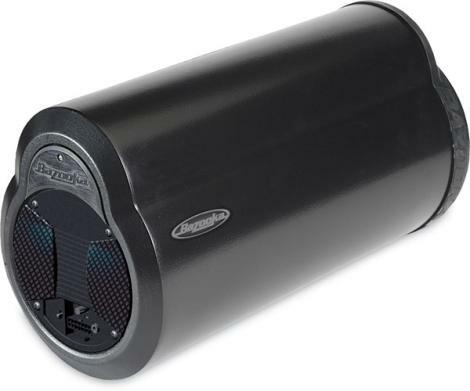 Designed to be a simple-to-install, yet effective upgrade to your cars existing mobile audio system, the A100 Bass Tubes feature a 100 watt, 2-channel amplifier built right in, coupled to a dual voice coil woofer. Since the amplifier has a built in crossover to remove the high frequencies the woofer cannot play from the signal, you get exactly what you need in the A100scrisp, clean bass and nothing more. When connected to your system, the end result is seamless integration, both electrically and audibly, yielding sound quality your factory autosound system simply cant touch. The BTA8100 features a 8 inch dual voice coil subwoofer, and fits in places most subs cant. The 8 inch works great behind the seat of mid-size and full-size trucks, the trunks of sedans or hatchbacks. Simply point it into the rear corner to take advantage of the Bass Tubes Enclosure , and youre rockin in no time! Use our F.A.S.T. harnesses to make installation even easier! At $49, theyre an easy way to protect your vehicles warranty by making installation a simple, plug-in process. The T-shaped harness has 3 ends: 1 plugs into your cars OE radio, 1 plugs into the plug you removed from the OE radio, and the 3rd end runs all the way back to the rear of the car and plugs into your A100 Bazooka subwoofer. Great for leased vehicles, the our F.A.S.T. systems are available most popular cars. The perfect accessory the BTA8100 is the RBCM, allowing you to control the amount of bass from the driver's seat, simply add the optional plug in Remote Bass Control Module (RBCM)! As with all Bass Tubes Enclosures , the BTA8100 comes with straps to keep the sub securely mounted, while still making removal quick and easy if you need even more cargo room. Optional Chrome-Plated UMS Brackets give a flashier look, as well as a more secure, permanent mounting when removal isn't a problem.